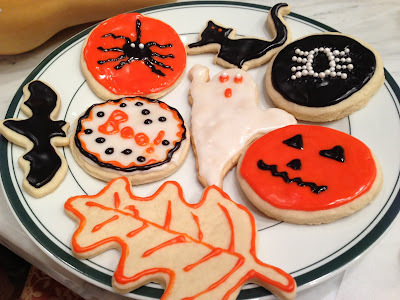 To celebrate Halloween, and for a treat to enjoy while we hunker down awaiting Sandy, I made some festive cookies. 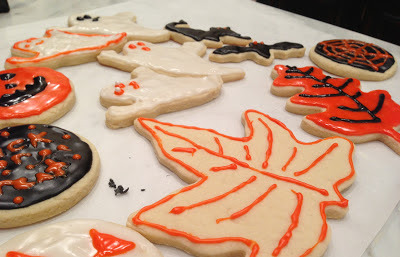 I used the same sugar cookie recipe as I did here, and this vegan royal icing recipe, and couldn't be happier with the results. I've struggled a bit in the past when it's come to decorating with royal icing but these have really made all the difference, so worth the tiny investment. What are you doing to celebrate? On a side note, to everyone on the East coast, stay safe! I've known about Murray's Cheese Shop for quite some time, first discovering it on a high school mother / daughter trip to the NYC. But since moving to the city, my interest has been peaked once again, especially now that I can participate in their classes. As an early birthday present, my boyfriend and I attended an Italian wine and cheese pairing class in their upstairs classroom, and boy was it fun! 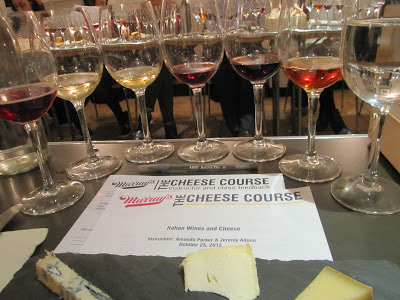 The class was led by a wine expert and cheese expert, both of whom were genuinely enthusiastic about their respective delicacies, so much so that their energy and excitement seemed to bubble throughout the entire room. 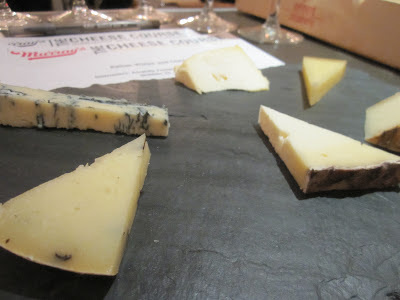 They discussed the origin and history of each cheese and wine and some of the science between wine and cheese pairing. Afterwards, the shop stays open an extra half hour, just for the students, so that you can explore all the delectable offerings. A class at Murray's would be perfect for a date night or evening out with the girls. 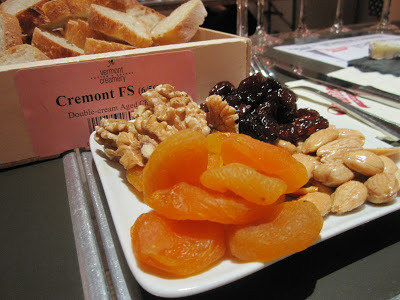 I mean, it's hard to go wrong with anything that includes wine and cheese, am I right? 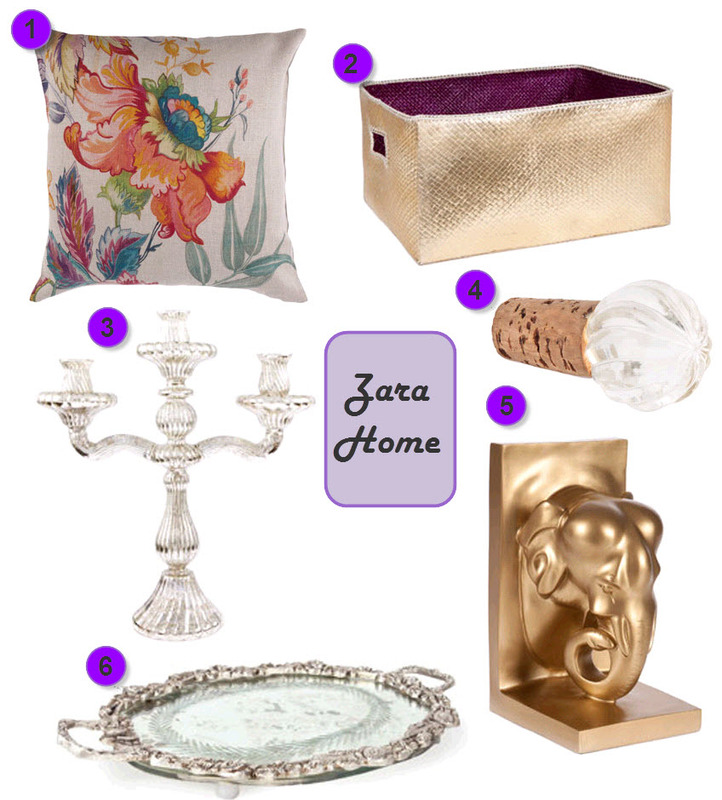 Zara recently launched its new home collection, and I like what I see! Just like their clothes, the home goods are pointedly chic and on trend, all while being reasonably priced. On a side note, and related to this post here, I recently watched the documentary "Happy" and I couldn't recommend it more (it's on-demand on Netflix right now). Might I suggest turning on the documentary while you shop Zara's home collection? That may just be the perfect combination for a happy eveing. The space heater that keeps me toasty at my desk all day. The expectation of yet-to-come adventures in NYC. Cooking dinner each night with my BF. Hot chocolate with a hint of rose water. During a quick visit to Rochester this past weekend, my Mom taught me to make ricotta from scratch, something that she swears by and that I now swear by too. The homemade ricotta is sweeter and has a slightly more citrusy taste than the store bought kind and, given how effortlessly you can make it, is well worth the extra work. While I used my Mom's personal recipe, this one is pretty similar, although I didn't use heavy cream. Once made, you can use it for any recipe that calls for ricotta - eggplant rollatini, ravioli, cheesecake, just to name a few - and trust me, you'll never switch back to store bought! While my Halloween decor taste has always leaned far closure to fall harvest than haunted house, I still love to do something a special and a little different each year to make my apartment feel more festive. After making glitter pumpkins last year, I wanted to do something equally glam and obviously gold leaf pumpkins seemed like the best option. It was quick and easy, and to be honest, required less cleanup than the glitter pumpkins. And while I chose to decorate a real pumpkin, this could easily be done with a fake one and used year after year. You'll need a pumpkin, or any object really, gold leaf spray adhesive, gold leaf, and a brush. 1. Protect your work surface with newspaper and spray your clean pumpkin, holding the adhesive about eight inches from the surface. Wait two minutes for the glue to become tacky. 2. 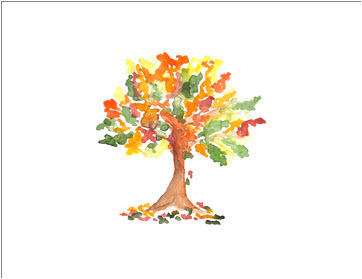 Use wax paper to pick up the gold leaf and press onto the surface. 3. Using your brush, press the gold leaf onto the pumpkin until the entire surface is covered. Don't worry about any creases or overlaps, this will only add to the look. 4. Allow the glue to dry for 24-hours and then brush off excess gold leaf with the brush. 5. Kick back, relax, and decorate! Mexican cuisine in my mind is and always will be comfort food; rich in flavors and complexity with a deliciously spicy kick. 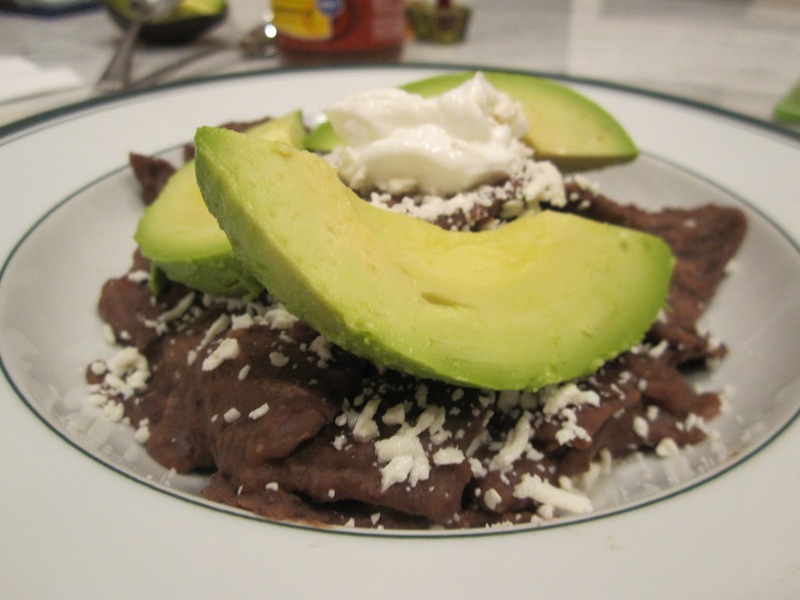 This means that Chilaquiles (chi lah khee lehs) is the comfort food of all comfort foods, the best of the best, if you will. The dish which is traditionally served for breakfast with eggs or dinner with meat can also be prepared veggie friendly (even vegan if you don't garnish with cheese and crema). 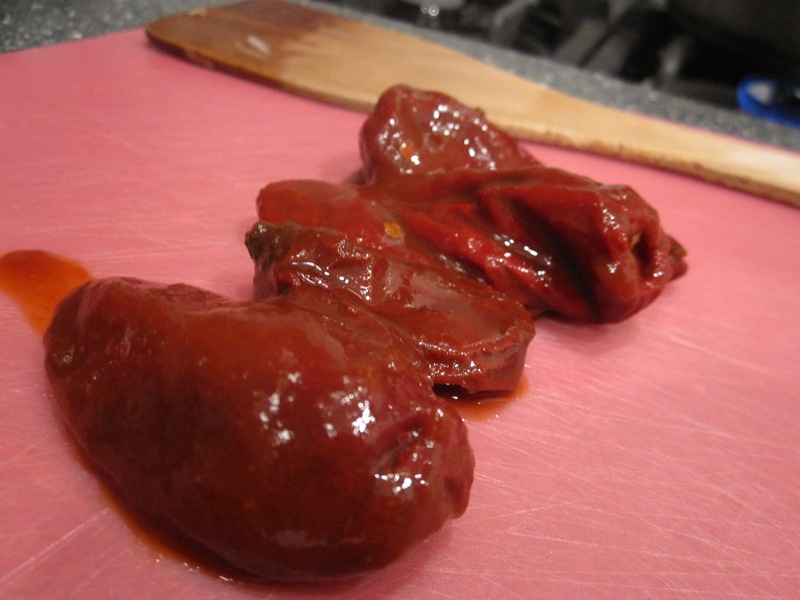 I use an adapted version of Rick Bayless' recipe (yes, that's the chef who owns this restaurant), which is surprisingly simple and well worth it. Sautee the onions and garlic in olive oil until tender. 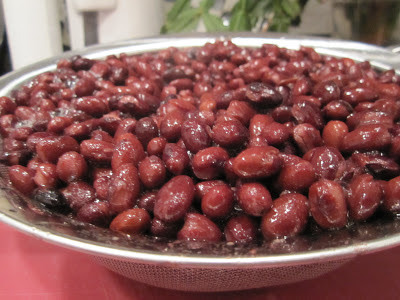 Add the beans, broth, and 1/3 of the chipotles and bring to a boil. Blend the bean mixture using an immersion blender or food processor, adding water or broth as necessary until it is the consistency of a thin cream soup. 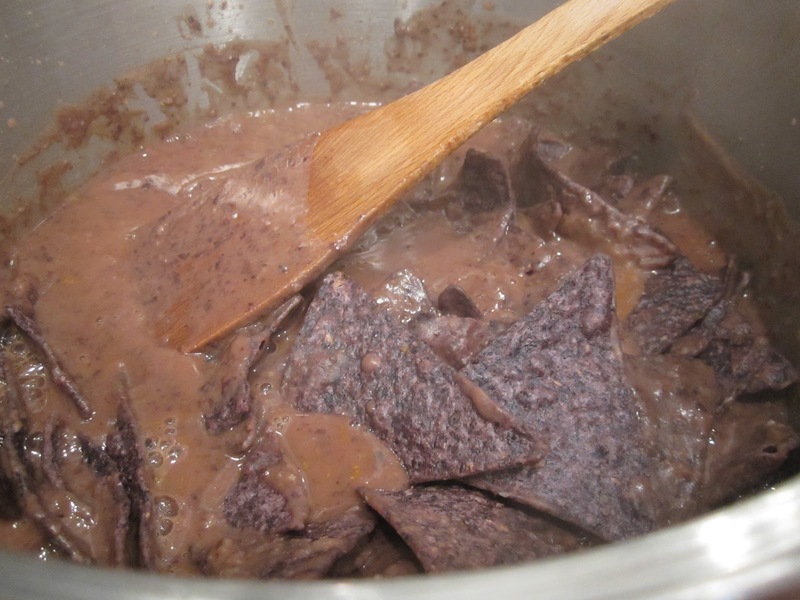 Bring the bean mixture to a boil and stir in tortilla chips, ensuring that they are fully coated. Let sit until tortillas are soft but maintain chewiness (3 to 4 minutes). 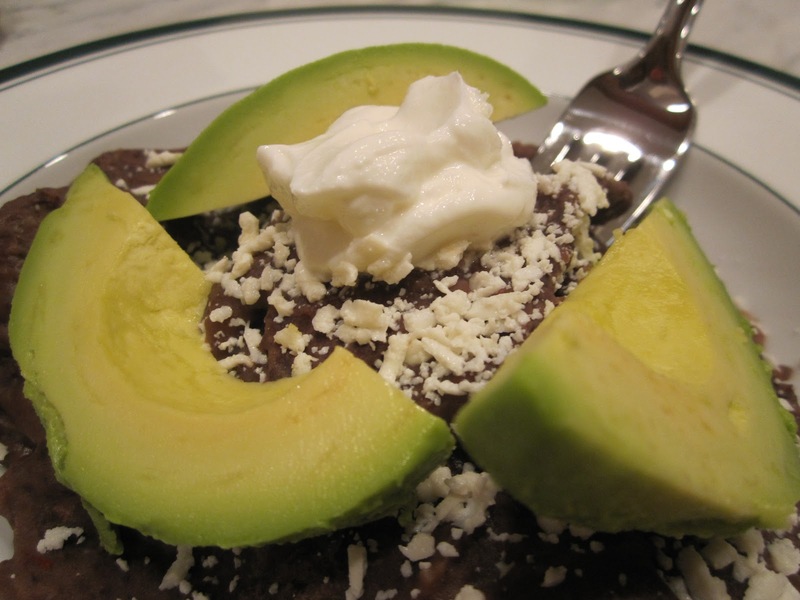 Serve immediately, garnish with avocado, cotija cheese, and crema (I like to use Greek yogurt as a low-fat alternative). You can buy chipotle peppers canned in adobo at most grocery stores. I love using blue corn tortilla chips to enhance the color. Stationery, to me, has always seemed like the epitome of good manners and elegance. There is nothing quite like receiving a handwritten note, (be it for a birthday, thank you, holiday…anything really), on lovely paper. 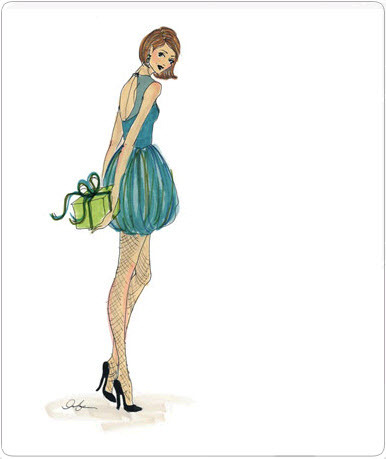 Through my recent pursuing of "Miss Manners Guide to Excruciatingly Correct Behavior" (something I would actually recommend for everyone to read, she's quite funny), I discovered her list of the traditional "stationary wardrobe" as she calls it, which even she admits is a bit excessive. 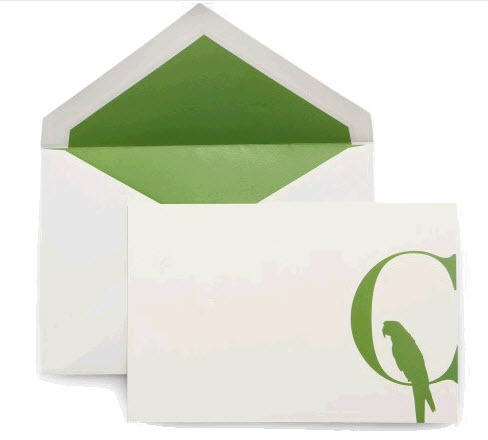 Instead, she recommends that everyone should have, at the very least, single sheet paper either unmarked or with an address engraved. 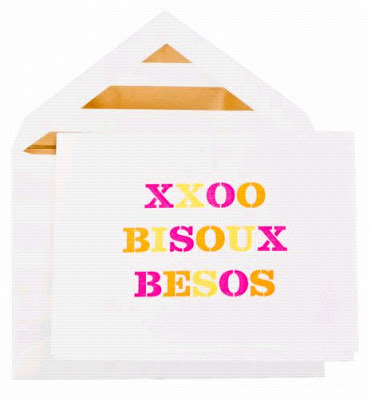 While I'm all for manners, I don't think my friends and family would mind very much if they instead receive my letters on what I will call "pretty" paper, in fact, I think they might prefer it; which is why I've included a few of my favorite stationary and card options, including a few that would make oh-so-adorable, DIY projects. Enjoy! Oh and two helpful tips: When signing or addressing a card, the wife's name is always listed first, followed by her husband, and then any children; as in, "Dear Jill, Jack, and Janie,". Of course this does not apply if you use the formal "Mr. and Mrs." greeting. 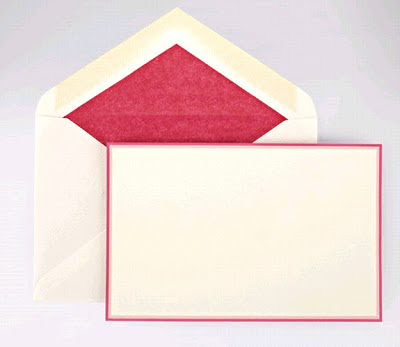 Also, a little trick for remembering the difference between stationary (still) and stationery (paper), the spelling for the paper form has an "e" for envelope. This morning on the subway I got a real taste of, shall we say, the eclectic nature of some New Yorkers. While one woman sat ranting about how Romney was the Anti-Christ, she had drawn all over his picture in the news paper with arrows pointing to him stating "not a good man", another proceeded to throw up all over the subway. Yuck, and what have I signed myself up for? Every place has their crazies, but I think New York has a special breed, yet at the same time, I think it's great to live in a city that is such a mix of ethnicities, beliefs, and personalities. Oh my goodness these are lovely, aren't they? 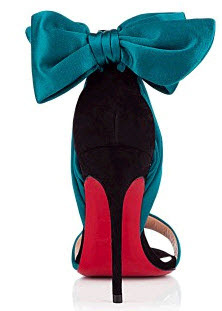 As you may remember, I have a bit of a thing for bows, but those shoes, which also come in black, are just on a whole different level. I've started an account on paypal so that everyone can donate towards my purchase of these beauties. Kidding, kidding, but seriously, who is buying me these? Oh Monday. I've been getting the Sunday night blues much more often since making the move to NYC; I think it has a lot to do with missing my lovely Philadelphia coworkers who were much more like friends than anything else. That said, I need to start reframing my outlook, since, let's be honest, I now live in New York and I don't want to have the blues every week. 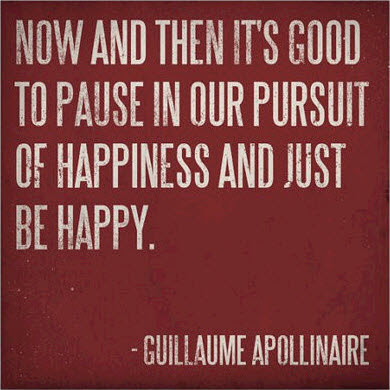 This quote resonated with me this morning because life is what we make it and each day should be lived to the fullest. Thanks for the reminder, pinterest. 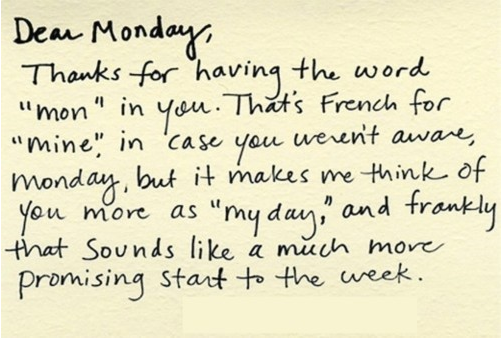 So here is to "my day" and to many Monday, my days in the future. Hope this outlook helps you get through your Monday, too!